The last time the Boston Red Sox and roughly 40,000 of their closest fans were in Fenway Park, a celebration 95 years in the making erupted. Boston claimed its third world championship in a decade, but just its first clincher at America's Most Beloved Ballpark since 1918. Today, as the team comes back to begin the 102nd season at Fenway, the Red Sox will enjoy another celebration. This one to culminate the championship that was won with a ring ceremony, championship banner waving high above and the Opening Day at the park. 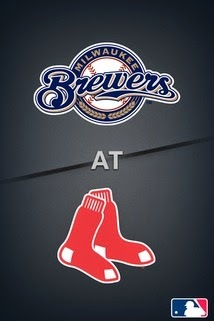 With the Milwaukee Brewers in town, the Interleague matchup will be a first for Opening Day in Boston. Getting the nod on the mound for this afternoon's contest is Jake Peavy, who celebrated the championship in his own unique way by purchasing one of the Duck Boats used in the "Rolling Rally" parade last fall. Peavy was 12-5 overall last year, split between the Sox and the, umm, Sox (both White and Red varieties). With Boston, he went 4-1 with a 4.04 ERA after being traded at the deadline. He didn't have his best stuff in the Postseason, but he's got a strong mindset about this season - at least he indicated so in Spring Training. Right-hander Marco Estrada will be on the mound the for Brew Crew. Estrada has been with the Brewers since 2010 and went 7-4 with a 3.87 ERA in 21 starts a season ago. Opponents batted just .229 against him, so the intrigue here is to see how the vaunted Sox lineup matches up. The Red Sox led the American League with a 53-28 record at home last season. The win total and percentage topped the AL and were third across all of MLB (behind Atlanta-56 wins; and St. Louis-54 wins). With Thursday's series win against the Orioles and a split between the Blue Jays and Rays, Boston moved into first place in the AL East for the first time this season. The Jays and Rays are a half-game back while Baltimore and New York are a full game behind at 1-2. At 21, Xander Bogaerts is the youngest Red Sox to hit safely in each of the team's first 3 games since Tony Conigliaro at 19 in 1964 ... A double in Dustin Pedroia's last at-bat Thursday was his 400th career extra-base hit ... Since Boston won its 2004 World Championship, the Red Sox are undefeated (9-0) in home openers.